• Splash pad may be closed at any time due to weather, maintenance or other operational concerns. • Splash Pad is unsupervised. • All children under the age of 10 must have adult supervision. • Toddlers must wear swim diapers. • Patrons engaging in horse play or foul language will be asked to leave. 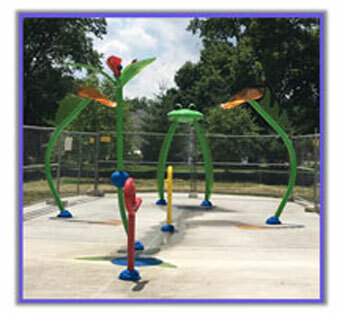 • Climbing on the splash pad features is strictly prohibited. • Keep glass containers, bicycles, skateboards and in-line skates off the splash pad. • No food or drink on the splash pad. • No pets allowed on splash pad.